We have been hoping this would come onto the market and now that day has come. 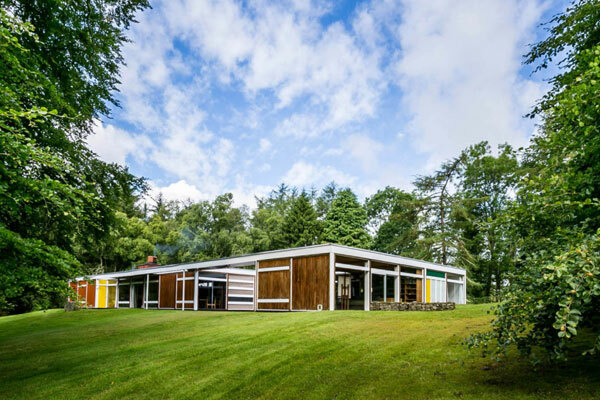 The 1950s Peter Womersley-designed Klein House in Selkirk, Scottish Borders is now available. If you follow our Instagram account, you will know that we recently mentioned the amazing Bernat Klein Studio, which is also nearby in Selkirk and currently in a state of disrepair. Thankfully, the house commissioned by textile designer Bernat Klein a couple of decades earlier is in far better shape. As a result, it has a rare Category A listing from Historic Environment Scotland. 1950s midcentury modern: Peter Womersley-designed Klein House in Selkirk, Scottish Borders Dating back to 1957, this stunning single-storey, midcentury modern property sits in over three acres of land, offering some wonderful views of the Scottish countryside through its floor to ceiling windows.